Winners of the 2010 Grace Awards are entitled to place this badge on their blogs, website and other such publicity endeavors. The Grace Awards wishes to thank Joy Tamson David for creating the design. The Grace Awards, the most democratic awards in Christian fiction, is very proud to announce its 2010 WINNERS. We’ve tried to use, if you will, a separation of powers in chosing our winners. The nominating (via email) was done entirely by readers. The Chair of the Board counted votes and determined finalists. Finaling titles were given to judging teams. At that point there was no contact between the teams and the Chair, except for an adminstrative issue. After teams picked a winner the scoresheets were destroyed and the names of the winners were given to the Chair. Each step in the process operated independently of the other. We are thrilled that our winners include self-published works, titles from small houses, as well as from moderate and large traditional houses. Our finalists included titles from ebook publishers. Our aim was to be an egalitarian awards, and we believe we’ve accomplished this right out of the gate. Meander Scar is a bold novel, successfully tackling the edgy topic of an older woman involved with a younger man. Lisa Lickel sets up a realistic and believable scenario with clear and vivid descriptions. Romantic scenes cause the heart to flutter. The pacing is well done, keeping the reader engaged as the tension builds. There are a few interesting twists – Ms. Lickel has a grasp of building a tense scene then not giving the reader what they want (i.e. making you read on)! Despite the edgy subject, Meander Scar has a nice spiritual theme of faith and a strong element of purity before marriage. Simply put, this book was masterfully written and a pleasure to read. There was plenty of intrigue, suspense and mystery – all the murder and mayhem that we would expect from a book in this genre, but Bertrand manages to balance this with some deep human elements as well. Detective Roland March is a disillusioned and misunderstood Houston cop, relegated to special assignments nobody else wants. His character is flawed, yet these imperfections only make us pull for him all the more. He gets his big chance for redemption when he is assigned to a missing person’s case – he thinks is connected to a drug murder; but proving it might just cost him his life. Bertrand’s voice is fresh, descriptive, insightful and never cliché. The story unfolds at just the right pace and the suspense is high throughout. Coming from a Christian publisher, I can say that this book will appeal to the masses, no matter what one’s religious stripe. There are some Christian characters in the book, portrayed as real people and there is never a preachy moment. This is achieved, I think, by the use of the first person narrative. Since the main character himself is not a believer, he is simply observing the behavior of those around him, weighing their worth on a human level. Back On Murder is a worthy recipient for first place in this category. Our team felt Seasons in the Mist stood out because of its skillful pacing, overall good writing and strong sense of time and place. A gripping love story, political intrigue and unexpected adventure all pull the reader along. Time travel adds an interesting element to this book and presents conflicts for the heroine. Time travel isn’t the usual fare in Christian fiction. 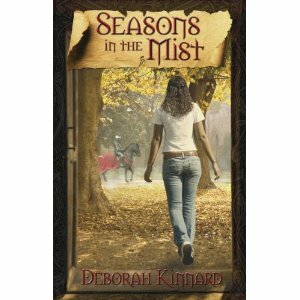 However, author Deborah Kinnard crafted a unique and compelling story world with well-researched historical details that along with heroine Bethany Lindstrom pulls the reader through the mists into that long ago time. The novel’s key strengths were the delightful use of medieval English prose and the artful weaving of rich historical detail into the story line making it come alive. The reader grows to care about the characters while getting the feel of ancient Cornwall with its heraldry, falcons, roast boar, midwifery, and royal courts. The judges were impressed by the author’s strong writing and ability to shape a fresh and dynamic storyline. Ms. Gardner doesn’t write like a debut author! She kept my attention right from the beginning of this story. I feel that the overall writing of this story, that it was very well-researched and that the character development was so exceptionally well-done merit extra consideration. The pacing of the story was excellent and the setting was well established. The ending of the story was appropriate and, even if for some readers maybe a little unexpected because it wasn’t a definitively tied-up “happily ever after,” this was a very realistic way to finish the story. The story also offered much to consider as regards questions of faith… Adela was portrayed as holding on to her faith in suffering, while there was a very well-done contrast in Lillian’s realistic difficulty with forgiveness in the face of hers. The character development and conflict were exceptionally well-done on all points. The writing was very fresh and unique. Great use was made of the vocabulary: The excellent usage of dialect and the utilization of Spanish. The background study pertaining to Zachariah McGirth, Red Eagle, etc… All of these aspects made for a compelling story. Secrets Under the Midnight Sun was well-written and easy to read. The book would make a great movie and I wouldn’t change a thing about the story. It’s a relevant and edgy novel that is worthy of praise. It even made me cry. The way the mother responded to her daughter’s secret was totally believable. I’ve seen the same thing happen over and over in child welfare. Regarding the setting, I felt solidly planted in the 1960s and in Alaska. I loved the analogies that were made, like when the character compared the struggles in her life to the setting where she lived. Great use of words and vocabulary. I could see everything in my mind’s eye. The insight and spiritual connection was just right, and not overly stated. The biggest strength of this novel was the internal conflict and how true-to-life it was portrayed. The author didn’t write how people think the daughter’s issues should resolve; she actually captured how many victims respond to abuse, and how they try to cope with the fallout of that painful revelation.